Have you ever wanted to eat from a Dunny...? Scoop Sundae from a squat toilet.....? Drink from a urinal...? No.......? Toilet Story - . It all started when one in a group of self proclaimed "Muckrakers" was reading the manga Dr. Slump on the toilet – and the rest was history. In the beginning, they mainly sold ice cream – a big pile of chocolate ice cream sold in containers shaped like a squat toilet. This humorous spin became a great success. After much planning they finally took the first step towards realizing their dreams in May 2004 with the launch of the “Marton Restaurant”. 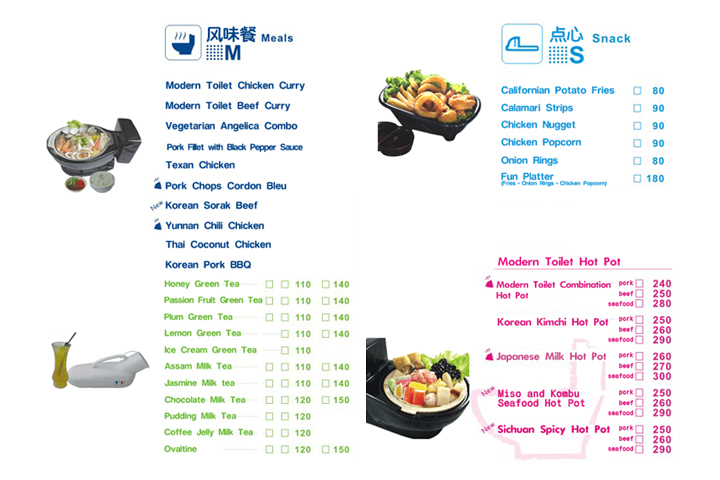 The restaurant immediately caused a stir in Taiwan with its humorous “out-there” design. At the start, many people peered in at the restaurant trying to figure out what they were selling – then had a big smile on their face when they finally worked it out. By continuing to come up with great ideas and making improvements on old ones, they have expanded over the past few years from just ice cream into a fully-fledged theme restaurant with stores all over Taiwan. Check out the Decor. Toilet seats for well..Seats, Basins for Tables and Poo lamp shades. I'm not brave enough to order a curry served in a toilet bowl, would you be?" Jake and I had just finished the best Dim Sum ever from a Restaurant around the corner and were totally chockers, so we opted for the dessert section. Just a nice simple ice-cream in a squat toilet mmmmmmmm. Yes I have to admit it is all a little unsettling and the demographic of clientel are pretty much high school kids. They even sell Poo Merchandise......?!?!?!?!?!?!?! So...if your up for a bit of a laugh, pop into The Modern Toilet. Who knows what they have on the menu now..and what they'll dish it up to you in! What a wacky place! thanks for sharing your adventures!! Ermm... nice toilet idea but I have trouble eating that ice cream!